Visit MaddyLane's Photo Blog of images taken around Hudson - updated daily. 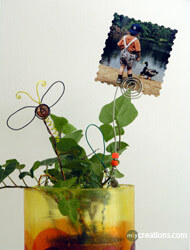 Photo-clips: Gardens of memories for Mom! Hands-on time: Approximately one hour to make 6 wire photo-clips. Total time: add drying time if you choose to paint wires in assorted colors. Skill: Easy and tween and teen friendly. • Planter or flower presentation of your choice. 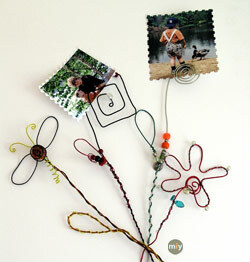 This Mother’s Day, give mom a garden of memories adorned with stylish wire photo-clips with pictures of cherished loved ones. These glittering wire photo-clips are easy to make in no time at all. They can range from simple flat spirals shapes to elaborate flowers or dragonflies which can be beautifully enhanced with beads. 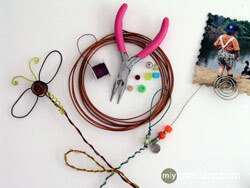 This is a simple project to try if you’ ve never worked with wire or beads, even tweens and teens can create something special for their moms. Select colored wires and beads to coordinate with your planter presentation. Spiral photo-clips: cut a wire piece of about 50 cm long with wire cutters and make a small hook shape at one end with pliers. Make four to five spirals by working around the loop, wrapping the wire around it several times, growing ever-larger using pliers or your fingers. You can thread assorted beads at different intervals along the stem or onto the tip of the spiral. To make a leaf shape, cut a wire piece 15 cm long in a green color, make a curved loop shape, twist the wire ends together and then twist it around the stem to secure in place. The spirals can be shaped to form square, star or triangular spirals. 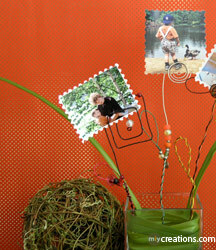 Flower shaped Photo-clips: with a wire length of 1 meter, at one end make a shape spiral of four turns slightly overlapping, creating the clip part to hold the picture. To make the petals make five loop shapes with your fingers bending the wire back and forth around the spiral center. After creating the last loop, the wire continues as the stem part. To embellish the flower, wrap silver wire around the petals and stem. 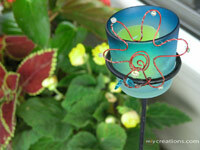 Use wire to attach small beads and leaves to the flower by twisting the wire around the flower. 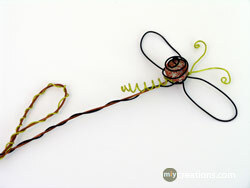 Dragonfly photo-clips: at the end of a 1 meter wire length, make a small spiral of four turns to make the center clip. Continue to make the wings with two loops shaped with your fingers then tuck the long wire through the spiral to make the stem. Open the spiral to create a balloon shape and insert a glass marble or bead inside, then close the spiral to secure the marble inside. For the antennas cut a 10 cm piece of wire in a contrasting color, make a small eye loop at each end semi spiral, bend the wire in half and twist onto the wings to attach them into place. To make a corkscrew of tail wrap a 10 cm piece of wire around a screw, and twist off to release. Attach the corkscrew tail, to the spiral part just under the marble by twisting it to the wire. Adorn the stem with contrasting wire colors and leaf loops. 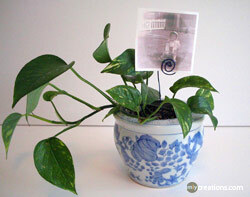 For each photo-clip, make a V, U or triangle shape at the end of each stem and bend the wire to make a foot like shape, to use as an anchor base to insert the wire-clips into the planters. Simple add favorite pictures. Let your imagination soar to create several types of free-form photo-clip shapes, by making a variety of spiral shapes and by adding combinations of corkscrews and assorted beads. To put a twist on things make each stem different with assorted curves and zigzag bends to spring shapes, the variations are truly endless. Tips: Grass takes a week to grow from seeds, this give you just enough time to grow it to make a unique presentation for Mother’s Day. Try growing grass in a rectangular bread pan or in a muffin tray which has been painted in fresh spring pastels or silver. Enhance your planter presentation with a little Zen appeal simply by adding colored pieces of tumble glass, glass bead nuggets or assorted rocks. Instead of buying wire in several colors you can paint wire with glass, acrylic or spray paints. Variations: Individual wire photo-clips can be added as an accent to embellish various home and garden decorative accents, such as votive candles, or added to a bouquet or adorn a gift. You can make a spiral shape base for each photo-clip or make stands with self-drying clay in assorted shapes from squares to triangles.